So let’s start by ID’ing the main culprits of insulin resistance so you know what’s causing all the trouble. It’s confusing to discuss insulin resistance (IR) without first talking about what insulin is or does first. See, whenever you eat, your digestive system has to break down your food into usable nutrients. Every time you eat high-carb foods like bread, pasta, or fruit juice, those carbs turn into a usable form of sugar called glucose when your body digests them. Your body uses glucose to fuel all your cells, just like your car uses gasoline to get you from home to work. During digestion, your glucose is released into your bloodstream, which makes your blood glucose levels — also known as blood sugar — rise. That’s where insulin comes in. When your pancreas realizes your blood glucose levels are high, it creates and sends out insulin to balance them out again. Insulin is a hormone responsible for pushing the glucose out of your bloodstream and into your cells where it can be used. This is what’s known as insulin signaling. As your muscle and fat cells pick up all the glucose, your blood sugar levels return to normal as a result. Insulin usually does a pretty good job maintaining healthy blood sugar levels in most people. However, sometimes your cells stop responding to insulin’s charm and become what’s known as insulin resistant. Insulin resistance is the root of many metabolic diseases, especially type 2 diabetes. When the cells in your muscles, liver and fat stop absorbing all the glucose in your blood, that sugar has nowhere to go, so your blood sugar levels remain high. Your pancreas responds by making even more insulin to deal with all the free-floating sugar. Your pancreas can keep up with this extra work for a little while, but it will eventually tap out when it can’t make enough insulin to control all the glucose. With your pancreas cells damaged and sidelined in the process, the glucose runs rampant, has a hard time getting into your cells and keeps your blood sugar levels abnormally high. So now you have high blood sugar and high insulin levels. If your blood sugar levels reach a certain threshold, you may be diagnosed with type 2 diabetes, where you’ll need prescriptions to manage your insulin and glucose levels. Coincidentally, a pre-diabetes or type 2 diabetes diagnosis from the doctor is usually when most people learn they have insulin resistance. And depending on how long you’ve left your high blood sugar unchecked, this could mean you need to start blood sugar-controlling medications as soon as you leave your doctor’s office. Let’s talk about why insulin resistance is such a big deal for your health. Doctors and scientists often refer to insulin resistance as prediabetes because if nothing changes in your diet and lifestyle, your body will not be able to keep up with all the sugar in your bloodstream and you’ll be diagnosed with type 2 diabetes[*]. These are some of the leading causes of death not only in the US, but across the globe[*]. According to the Centers for Disease Control and Prevention (CDC), 86 million Americans have prediabetes or insulin resistance (IR), but 25% of those people don’t know they have it[*]. Seems like the obvious reason for having high blood sugar levels is eating too many carbohydrates and sugary foods and beverages, and that’s partly true[*]. But living a sedentary life also raises your glucose levels because your cells never have a chance to use up all the sugar (read: energy) in your bloodstream[*]. Your age. Insulin resistance can affect people at any age, but it’s estimated that more than 40% of those over the age of 50 may be at risk of it[*]. Your race. If you’re of American Indian, Pacific Islander, Alaska Native, Asian American, Hispanic/Latino or African American descent, you’re at a higher risk for IR than others[*]. Already having high blood pressure. Over 50% of adults with hypertension are also insulin resistant[*]. Inflammation caused by a poor diet or an imbalance of healthy gut bacteria[*] leads to oxidative stress, which encourages insulin resistance[*]. Polycystic ovary syndrome (PCOS), which makes women more prone to insulin resistance and weight gain[*]. That’s why in addition to your annual checkup with your general physician, you should have your blood sugar checked every year — especially if you fall into any of these risk buckets. Let’s talk about a few signs you may be insulin resistant. Since your body tries hard to balance your blood sugar and insulin levels on its own, it can take years for you to reach the point of insulin resistance. Always feeling hungry. Intense sugar cravings like your tummy is a bottomless pit you can’t find enough carbs to fill it with[*]. Weight gain and an inability to lose weight (especially in your tummy). If you’re obese or overweight and you carry a large amount of weight in your tummy area, despite trying every weight loss diet under the sun, insulin resistance may be to blame. Bloated, swollen fingers and (c)ankles due to a potassium/sodium imbalance[*]. Skin tags and acanthosis nigricans, or dark, discolored parts of your skin in the folds and creases of your neck, armpits, thighs and groin area[*]. Male pattern baldness and thinning hair, even if you’re a woman[*]. So what happens if you think you might be insulin resistant? Schedule an appointment with your doctor ASAP. He or she will go over your medical history, give you a full exam and send you to take a glucose tolerance test to determine for sure. You’ll need to have your fasting blood glucose and insulin levels measured to see where you fall on the IR scale. High fasting insulin levels usually indicate insulin resistance. Don’t get too down if you hear bad news. Both insulin resistance and type 2 diabetes can be reversed. Exercising and losing weight have been shown to be the most effective remedies for becoming more insulin sensitive — aka having your cells be more receptive to insulin’s help. Since insulin resistance gets worse the more carbs you eat, research shows a low-carbohydrate diet like keto can be effective not only for losing weight but also for lowering your blood sugar and resetting the way insulin works in your body. So let’s dive into the connection between the ketogenic diet and insulin resistance. The average American eats between 225–325 grams of carbohydrates a day[*]. Every time you eat carbs, you trigger an insulin response. It doesn’t matter which type of carbs you eat — simple like processed foods or complex like starchy vegetables– they all get converted into blood sugar for your cells to use in the end. The more carbs and sugar you eat, the more glucose gets released into your bloodstream (and therefore more insulin too). So when you’re insulin resistant, carbs are your worst enemy. It’s kind of like having a peanut allergy. You’d miss peanut butter, but if you knew eating it would cause discomfort in your body, would you still do it? Most people would avoid peanuts altogether. You need to think of carbs like peanuts when you’re insulin resistant or overweight and want to lose weight. So instead of eating 300 grams of carbs per day, you’d limit your daily intake to between 25–50g. How can your body survive on so few carbs? It’s called metabolic flexibility. Just like your body can run on sugar from carbs, it can just as easily (and some say better) run on ketones from your body’s fat stores. 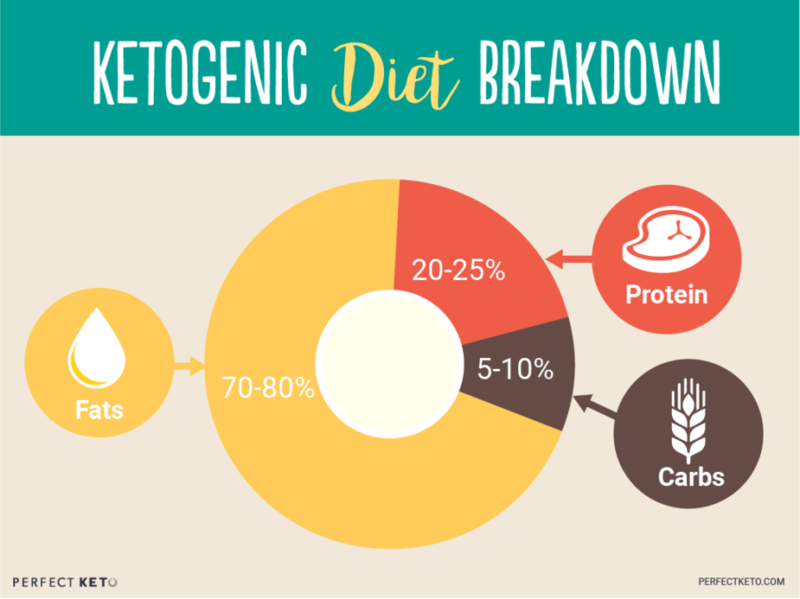 Ketones, also known as “ketone bodies”, are energy molecules your body makes by breaking down fat for energy when your carb intake is low, as we discussed in this article. When you remove sugar and carbs from your diet, your body will use up all the extra glucose in your blood. You’ll be able to reset your blood sugar and insulin levels since all the extra sugar floating around in your blood will be gone after a few days on a very low carb diet. As your body starts to run on ketones, it will make less insulin because there will be less glucose to handle. This will make your muscle and fat cells more responsive to that insulin. That makes keto the perfect insulin resistance diet. Clinical research finds a very low carb, high fat keto diet lowers fasting insulin levels, normalizes blood sugar, improves insulin sensitivity, and aids weight loss more effectively than low fat diets. In one of the first trials ever designed to see what kind of effect a ketogenic diet has on insulin resistance, researchers monitored the regular diets of 10 obese participants with type 2 diabetes for one full week. Then the participants followed high-fat ketogenic diets for two weeks. The combination of low carb eating and natural weight loss balanced out these participants’ insulin levels and made their bodies more capable of using insulin the right way again — without medication. Researchers discovered participants on the keto-esque diet lowered their triglycerides more than those in the other two diets and decreased their fasting insulin by 33%. Those on the high fat/moderate carb diet also lowered their fasting insulin levels (by 19%), but the very low fat diet had zero effect on lowering insulin levels. Plus, the very low carb diet triggered the best insulin and blood sugar responses after eating, meaning the participants displayed signs of being more insulin sensitive. This research also shows that sticking to unsaturated fats is not the answer. Your body needs all 3 types of healthy fats (saturated, monounsaturated, and polyunsaturated) to thrive, and you shouldn’t be afraid of increasing your saturated fat intake on keto — from coconut products, fatty meat cuts or dark chocolate. Science has now debunked the old myth that saturated fat contributes to heart disease and other metabolic problems. Reversing your insulin resistance means you may also be able to kick your type 2 diabetes diagnosis to the curb too. In one study of overweight participants with type 2 diabetes, a low carb keto diet (LCKD) improved their blood sugar control so much that most of them (17 out of 21 who completed the trial) either reduced or completely eliminated their diabetes medications in just 16 weeks[*]. And when moderately overweight women were asked to follow one of two diets: a LCKD or a low fat diet for four weeks, the low carb diet resulted in improved insulin sensitivity. On the other hand, the low fat diet raised fasting glucose, insulin and insulin resistance — the very opposite of what you want to happen[*]. In summary, the low fat, high carb (lfhc) approach is a terrible insulin resistance diet, while keto is the best. 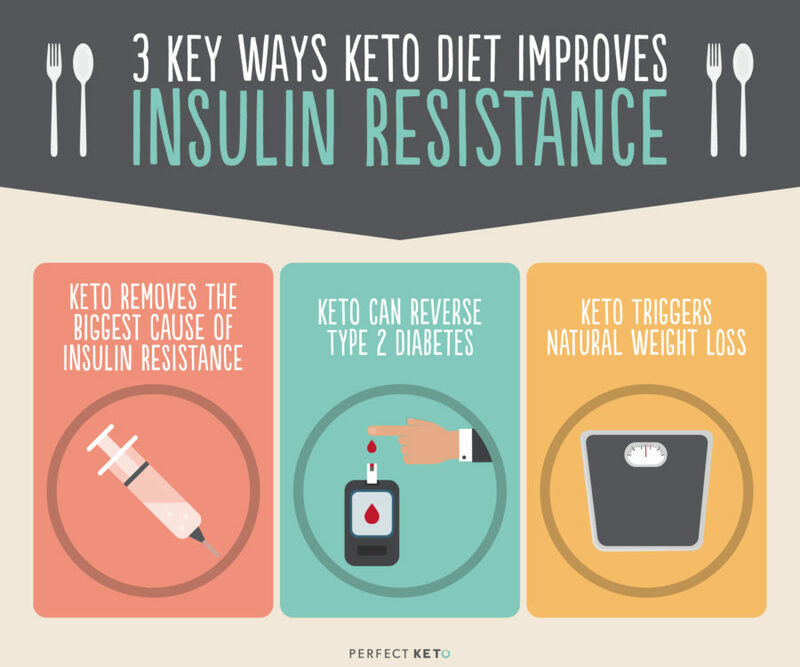 As your blood sugar and insulin levels start to normalize on keto — and your body switches to using fat for fuel — you’ll also lose weight naturally, which lowers insulin resistance too. Your body is always looking out for itself. Unfortunately, it’s not looking out for your selfies because when you have too much glucose in your blood, your body stores that extra fuel for later as fat cells. That’s why insulin resistance most often develops during or with weight gain[*]. That’s right, all those pockets of fat you don’t like on your body are there because your body saved this energy source in case of the zombie apocalypse and eventual food famine. That means when your blood sugar levels are high and your insulin is through the roof, you’ll never be able to lose weight. Insulin is a storage hormone, after all. So these reserves are now hurting your body, not helping it. And here’s the real kicker: when you’re overweight or obese — probably as a long time result of your insulin resistance — your fat cells start to contribute to your insulin resistance. Carrying excess body fat around your belly and between your organs releases tons of free fatty acids and hormones into your system. And guess what? They’ve been known to encourage insulin resistance. When researchers from one study wanted to find out if fat deposits had anything to do with insulin resistance, they measured fat mass from visceral abdominal tissue, regular fat tissue, and thigh fat tissue. They noticed that for every increase in visceral fat, there was an 80% increase in the odds of also being insulin resistant. And get this: patients with a higher concentration of fat elsewhere decreased their odds of IR by 48% and those with more thigh fat than other fat had 50% lower odds of being IR[*]. Essentially, belly fat = more chances of developing insulin resistance. The trick to getting rid of these fat stores is emptying your body’s glucose reserves. Only then will your body be able to start burning fat for fuel. That’s exactly what a keto diet does. Your body will thrive on your fat reserves so you can finally balance your blood sugar levels and insulin while you shed inches. If you’re ready to start following the ketogenic diet to reduce your insulin resistance and manage your weight, follow this 7-Day Keto Meal Plan for Weight Loss. 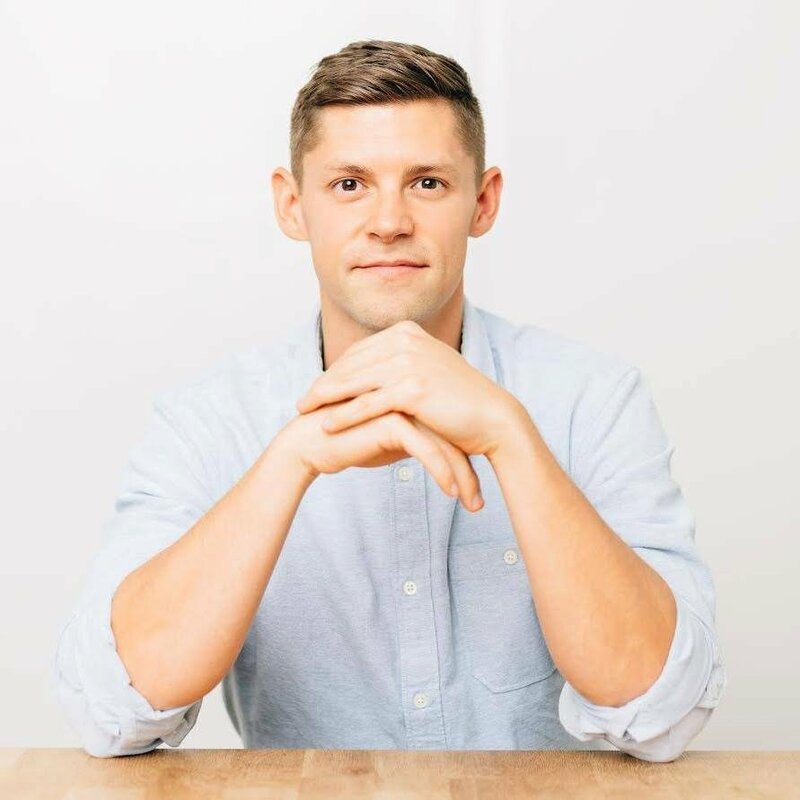 Jumping on a keto diet with a solid meal plan takes a lot of the guesswork out of the equation and lets you focus on what truly matters: improving your health. Weight loss is the number one remedy for reversing insulin resistance and type 2 diabetes, but there are a few other activities that also help you get back on track as we’ll discuss next. You don’t have to live with insulin resistance and type 2 diabetes forever; both are completely reversible in most people with simple diet and lifestyle changes. Exercise for at least 30 minutes every day. Aside from diet, daily activity is the number one factor in how insulin sensitive you are[*]. Moderate activity will use up the free-floating glucose in your bloodstream to lower your blood sugar levels and increase insulin sensitivity[*]. A single sweat sesh can increase glucose uptake by up to 40%[*]. Losing belly fat will also lower your IR too[*]. Stop smoking because this gross habit also increases your insulin resistance[*]. Improve your sleep, which should be easier when you cut the carbs and start exercising. One study demonstrated that partial sleep deprivation for just a single night triggered insulin resistance in healthy subjects — so imagine what you’re doing to your body if you’re already overweight and have a poor sleep schedule[*]. Try intermittent fasting, which has been scoring promising results for insulin sensitivity and weight loss[*]. Lower your stress. Stress increases your blood sugar and the stress hormone cortisol, which triggers fat storage so your body has enough energy to “flee from danger”. Stress is correlated with higher blood glucose and insulin levels[*]. Yoga and meditation have been shown to improve both blood pressure and insulin resistance[*]. These aren’t complicated lifestyle changes. They’re steps everyone should be taking to live a longer, healthier life with fewer chronic diseases. Insulin resistance is a serious problem plaguing not only you and your family but the entire planet. Without proper intervention, long-term unchecked insulin resistance can lead to type 2 diabetes, cardiovascular disease, and an early death. The good news is simple lifestyle changes and adopting a low carb, high fat ketogenic diet can help you manage your blood sugar levels and lower your insulin levels so you can become insulin sensitive again — and ditch those expensive prescriptions too! Every study we discussed today highlighted the fact that low fat diets don’t work to control your insulin resistance like low carb diets do. So check out the ultimate guide to the keto diet to see what it takes to start one today.